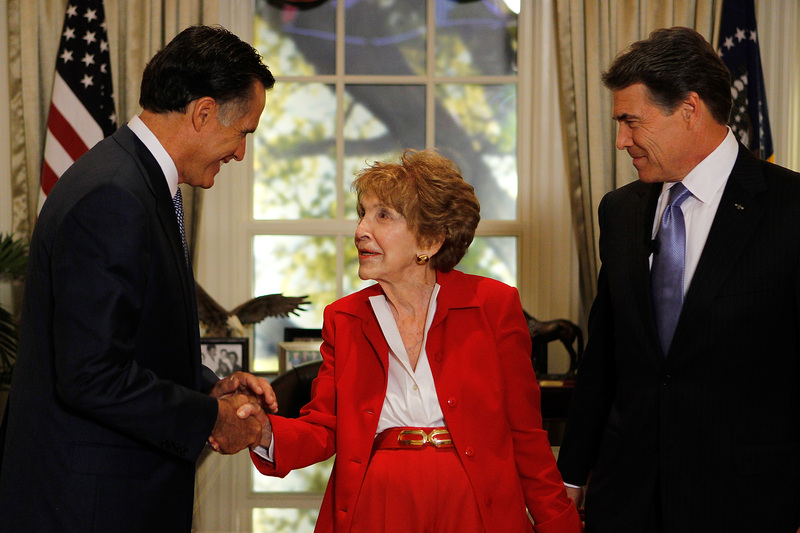 9 Things You Didn't Know About Nancy Reagan, Whose Accomplishments Were More Than "Just Say No"
On Sunday, March 6, former First Lady Nancy Reagan passed away from congestive heart failure in her home in Los Angeles. 94 at the time of her death, Nancy was best known as the stalwart wife of her late husband President Ronald Reagan, as the creator of the anti-drug initiative "Just Say No," and as a fashion icon. However, there is so much more to Nancy's legacy than most people know. Like her husband, Nancy was an actor before she entered the world of politics, and while she was passionate about her role as Ronald's wife, she was also a force to be reckoned with inside the White House. From preserving history to crossing the political aisle to support causes she believed in, Nancy became one of the most influential First Ladies in American history. When she spoke people, particularly women, listened. When she was diagnosed with breast cancer in 1987, Nancy inspired more women to receive regular mammograms. When her husband passed away in 2004 of Alzheimer's Disease, Nancy stood strong despite losing the love of her life. She continued to have a strong voice in politics, endorsing candidates and fighting for change until she died. Nancy's strength, wisdom, and legacy will endure, but there are still many things you might not know about this remarkable woman. Nancy's first appearance on film was in a 1940 short created by the National Foundation for Infantile Paralysis. Shown in theaters before the feature presentation, the film was designed to raise money for the prevention of polio, making even a young Nancy a health advocate. In 1981, Nancy spearheaded the renovation of The White House. While the move was criticized at the time since the United States was in a recession, the renovation was much needed as the building was falling into disrepair. Her efforts updated the White House while preserving its historical integrity. Nancy was passionate about the legalization of stem cell research, and she fought for its legalization as early as 2004 when George W. Bush was president. When the ban was lifted by President Obama, Nancy praised his decision. Nancy's mother and godmother were both actors, and she followed in their footsteps for a short time. While she only made a handful of films, she was most proud of the work she did playing a widow in Night Into Morning , according to FirstLadies.org. In 2002, Nancy was awarded the Presidential Medal of Freedom for her tireless work in helping POWs and veterans, as well as advocating for The Fosters Grandparents Program and her anti-drug program. The Medal is the highest honor a civilian can receive. Nancy's drug prevention initiative knew no boarders. In 1985, she hosted an international conference on drug abuse among young people by bringing together the first ladies of 17 different countries. When President Ronald Reagan was almost assassinated, Nancy saw herself as her husband's protector. As part of her role she consulted with an astrologist regularly and planned President Reagan's meetings and appearances around her advice. Nancy had no patience for anyone who criticized her devotion to her husband. She was a proud feminist, saying in a 1985 interview with McCall's magazine that "Feminism is the ability to choose what you want to do." As the First Lady, Nancy was an active adviser to her husband — although reportedly, everyone in his Cabinet appreciated her input. For her part, Nancy's only concern was in helping to guide her husband. In her 1989 memoir, My Turn , Nancy said, "However the first lady fits in, she has a unique and important role to play in looking after her husband. And it's only natural that she'll let him know what she thinks. I always did that for Ronnie, and I always will." At once controversial and beloved, Nancy Reagan defied all conventions to become truly one of a kind.